« Will you be betting on the YouGov family or ICM? Iâ€™ve put together a short series on UNS â€“ what it is, whatâ€™s its track record, and what levels of distortion have occurred in recent elections. This is part two of three. When did UNS break? It canâ€™t simply be one of those myths that itâ€™s fairly accurate â€“ it must have been a useful forecasting tool once. Iâ€™m going to show tables for the 1987, 1992, 1997, 2001 and 2005 General Elections, with the UNS results from the real score, the average eve-of-election poll score, the Golden Rule poll and its opposite (a â€œLeaden Ruleâ€ â€“ the poll thatâ€™s worst for the Conservatives). The UNS calculator is a simple 3-party one (SNP/Plaid scores held constant) and â€œeve-of-electionâ€ includes all polls from the last three days of the campaign. Wow. Not bad. Not bad at all, given the limitations of the simplifications. In 1987, the UNS worked pretty well. So, from all accounts, did the polls (I couldnâ€™t find the pre-election polls readily online, Iâ€™m afraid). Every forecaster was left happy â€“ the polls were fairly accurate, the UNS tool worked well â€“ what could possibly go wrong? Then came the debacle of 1992, and things were never glad confident morning again for UNS. Or the polls. When the polling errors were removed, John Major should have only lost 15 seats from Margaret Thatcherâ€™s 1987 landslide. He lost 41, his majority falling from a notional 71 (under UNS) to just 21. The simultaneous failure of the polls only added to the impression that flipping coins would be more accurate. The errors occurred in opposite directions, however, and the terrible performance of UNS was masked by the polling errors â€“ had they occurred in the same direction UNS from the polls would have predicted a Conservative majority of 173 with Labour reduced to sub-Foot levels. Itâ€™s notable that â€“ on a straight UNS from 1987 â€“ an equal score of 38/38/20 would have actually left the Tories as the largest party in a hung Parliament (theyâ€™d have been on 312 to Labourâ€™s 298). The pro-Labour distortion with which weâ€™re so familiar â€“ so much so that itâ€™s now an article of faith â€“ did not exist prior to 1992. In 1997, the polls failed once again (with the honourable exception of ICM). However, this was barely noticed at the time, for two reasons. One â€“ the outcome was hardly in doubt. Two â€“ the failure of the polls was countered largely by the failure of UNS. So whilst the polls were out and UNS were out, if youâ€™d run UNS from the average of the polls, youâ€™d have been not too far out. In reality, Blair should have had a majority 46 less than he did, and Major should only (!) have lost 137 seats from his notional 343, leaving him on about Michael Foot levels of representation â€“ 41 seats stronger than the position in which the Conservative Party actually found itself. 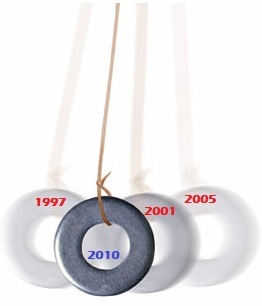 In 2001, the polls and UNS again failed in opposite directions. Again, the polling average and UNS errors nearly cancelled out. Labour overstatement in the polls was matched by Labour comfortably exceeding UNS â€“ losing only 6 seats when UNS had that figure nearly tripled. William Hague increased Conservative representation by only 1 seat, when he should have done precisely sixteen times as well. According to UNS. However, in 2005, the polling error and UNS error were in the same direction. Labour were once again overstated, but this time, the Tories clawed back a little of their accumulated losses beyond UNS. Howard did better than he should have done â€“ especially when looking at the average of the final polls. Blair should have retained a landslide.